Included in the setup, w a r m t h - r e s i s t a n t protection cover and glove for easy use. Easy to use “one-touch” temperature control system. Sleep-mode system: if not used, the iron shuts down automatically after 60 minutes. Power cord with 360° swivel. With a simple, easy swipe creates waves or soft locks. In only 17 seconds it reaches its working temperature, and maintains it constantly through all the styling. 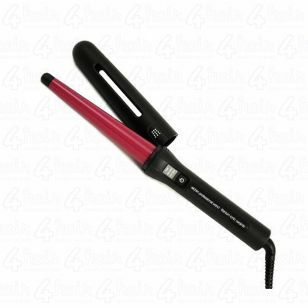 The ceramic and titanium oxide coating emits negative ions and infrared light to maintain the hair in perfect health.